Like the other mini games in Kingdom Hearts 3, you get your first taste of the Festival Dance during the story when you reach the end of the Kingdom of Corona. After that, you can return to the woodland town to partake in the Festival Dance whenever you please, summoning all the villagers at your whim. You'd think they'd get worn out with all that dancing. 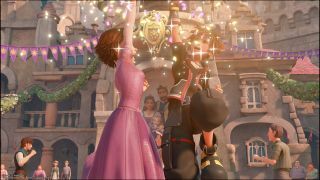 Nevertheless, scoring 70,000 points is no mean feat so here are some tips for earning the Kingdom Hearts 3 Festival Dancer trophy/achievement. There are a couple of different mechanics in play with the Festival Dance mini game, but the most important one that you can consistently do to earn points is to switch dance partners constantly. If there's a new partner available, prioritise switching over clapping through the purple rings. You'll earn far more points that way. Around the edges of the town square are barrels that you can perform on. Take a break from dancing with the townsfolk to perform on these, because you'll get a whole bunch of points in one go. They're not always available, but as soon as you see the green icon appear when you're nearby, make sure you do it. There are two stages to the Festival Dance; the main part where you can dance with whoever you want, and the section where you lead Rapunzel around the circle in the middle. You have to press Triangle/Y to activate this as soon as it becomes available, because it's a quick way to build your chain and as soon as you finish big, it adds a lot of time to your time limit in the main dance. If you can earn enough points so you can have two circle dances, you should easily soar past 70,000 points. As is the case with all the Kingdom Hearts 3 mini games, the combo - or in this case, the chain - is key. It multiplies the amount of score you earn for each action, so as long as you can keep building the chain then you should accumulate points rapidly. Gunning for all of the mini game trophies in the game? Check out the Kingdom Hearts 3 Shield Shredder award guide for completing the Frozen Slider trophy/achievement.